Redskins running back Alfred Morris could have bought himself a Range Rover or a Bentley or an R8 or a Lambo. He decided to have his 1991 Mazda 626 refurbished instead. And this is with over $700,000 in on-field earnings last year. You could say that buying a supercar isn't a great financial proposition, and it isn't, but even worse it makes you look like a cliche. Even worse, buying a Lambo and having it done in a camo vinyl wrap makes you look like an irresponsible prick when you compare it to what Morris is having done. 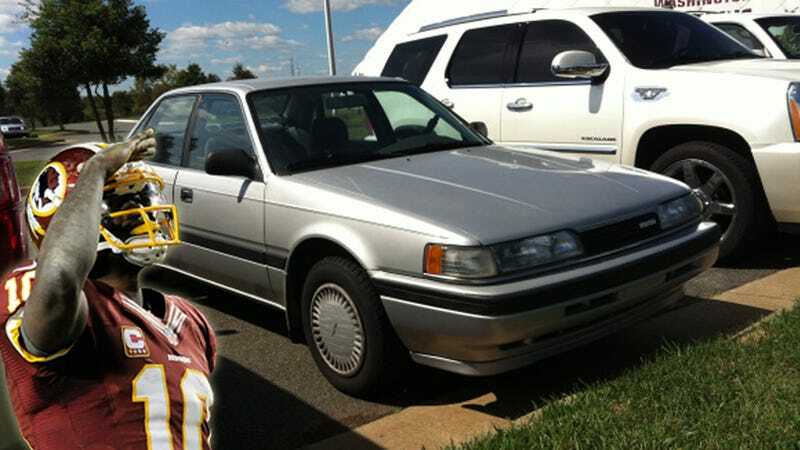 Yahoo Sports reports that he's sending his 22-year-old family sedan back to Mazda to be restored to showroom condition. He wants to keep it on the road another 20 years. He wants his kids to drive it. She’s getting refurb – Mazda is going to make her like new, like she came off the floor on ‘91. They actually just took it, so we’re going to switch cars while they’re doing it. They said it would take about 6–8 weeks to do it, but they’re going to totally refurbish it, so I’m happy about that… They’re just (refurbishing) it so that it can run for about 20 more years. It's like Ludacris still driving his '93 Acura — I have a lot more respect for Morris knowing that he's keeping his old car to keep himself grounded.